Now, as you may know, most states celebrate the independence day of their country. So naturally, you would expect La Paz to celebrate Bolivia’s independence day on the 6th of August and while they do do that, they also celebrate their own independence day on July 16th. But wouldn’t La Paz have gained independence along with the rest of its country? Well person reading, how about I explain. Now imagine you lived in Bolivia in Autumn of 1807. Napoleon has led his troop through Spain and invaded Portugal. This is a huge blow to your Spanish rulers who are already very weak. Not only that, but news of America’s independence in 1776 has been around for quite some time. With Spain weak and proof that small groups of colonists can take on their much more powerful leaders, why wouldn’t you believe you too had a chance to revolt and remove Spain from power over you? Well, that’s exactly what Pedro Domingo Murillo thought when, on July 16, in La Paz city, while preparations for the celebration of the Virgin of Carmen were about to begin, he and others attacked the city's military barracks and forced the Spanish Governor, Tadeo Davila and the Pope, Remigio de la Santa y Ortega, to resign. By July 27, La Paz was proclaimed independent. 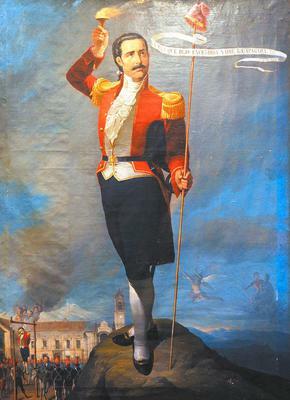 But this was only the beginning of Bolivia’s full independence for it would not be for another 18 years that Bolivia would become a fully independent nation in August of 1825.